Cyclists in Denton, like the ones seen here in Austin, benefit from the unanimously-passed safe passage ordinance that requires car drivers to maintain a safe distance from cyclists. Photo by jfre81. The City of Denton in Texas approved a traffic safety ordinance to assert the rights of the road for cyclists and other vulnerable road users. The “Vulnerable Road Users” or “Safe Passage” ordinance requires cars and light trucks to allow a safe passing distance of three feet, and requires commercial vehicles to allow a distance of six feet to vulnerable road occupants. The ordinance also requires vulnerable road users to remain as close to the side of the road as possible and stipulates that vehicles yield the right-of-way to vulnerable road users in all circumstances. “An operator of a motor vehicle passing a vulnerable road user operating on a highway or street shall: (1) move to the left lane if the highway has two or more marked lanes running in the same direction; or (2) pass the vulnerable road user at a safe distance,” the ordinance claims. Passed with a unanimous vote by the City Council, the ordinance establishes the rights of the road to all users, provides safety guidelines and encourages alternative modes of transportation. Councilman Dalton Gregory introduced the ordinance in February 2010, based on a similar ordinance passed in San Antonio the same month, the Denton Record Chronicle reports. The ordinance is directed at all road users and vulnerable road users are still required to be cautious and follow all city and state traffic laws. The ordinance is not only for cyclists and pedestrians; it also applies to wheelchairs, highway construction workers, tow truck operators, utility workers, stranded motorists, horseback riders and skateboarders. Denton is the eighth city to enact the ordinance in Texas. 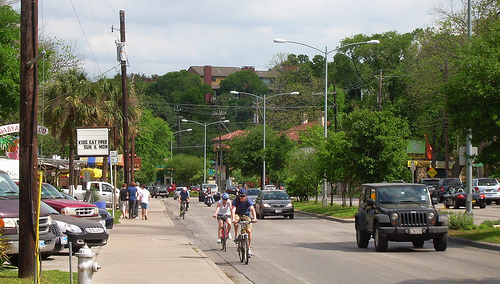 Austin, El Paso, New Braunfels and San Antonio are some of the other cities with similar safe passage ordinances, protecting cyclists and other road users from passing vehicles. Although Texas as a state has not incorporated comprehensive laws protecting vulnerable road users, other states have in an effort to balance the rights of the road to all users. Oregon enacted an ordinance for vulnerable road users in 2007, and Delaware and New York did the same in August 2010. However, these laws focus on enhancing punitive measures after an incident has already occurred. Although it is important to penalize negligence and carelessness, these laws come too late in the process, once the damage is already done. In order to be effective, these punitive ordinances have to be complementary to preventative laws and other policies.